The Hero’s Journey is the great myth. Life is a journey when we are called to deal with the great mystery of existence, and myths are important because they, in a way, describe the adventure and provide helpful clues for our own journeys. This journey begins with the suspicion that we are more than mere mammals and may lead us to realize that we are, as Teilhard de Chardin said, “spiritual beings having human experiences.” Myths help us deal with the mystery. Myths help us heed the call and understand that we must embrace the adventure. Myths can help us get to that sacred place within our own selves where we might be able to unlock our creative powers and do magnificent feats. Myths encourage us to live the life we were given, find the deeper meaning of our lives, our authentic selves, the truth, our untapped potential, our relationship with the world, our place in it, where we are in our journeys, what we are being called to do, and the enormous power we have. Myths allow us to learn about ourselves (and others, and the Universe) so we can thrive. The most heroic of all acts is to discover who we are, and who we want to be. It takes courage to follow our bliss and live the lives we are meant to live. Who are we in relation with other beings? How are we being called to become our best possible selves – creators of a new way of living at this critical time? What is home? Home is the authentic self, who we really are. Where is home? How do we return home? How do we get there? 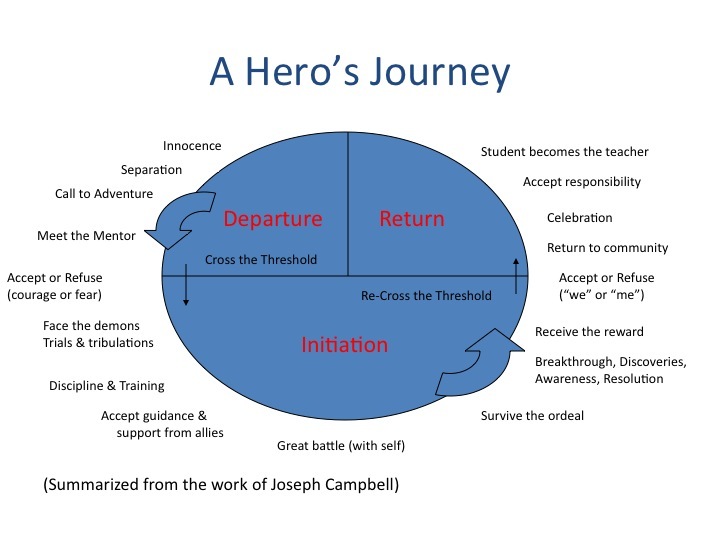 The Hero’s Adventure was broken down by Joseph Campbell in the following components, Departure, Initiation and Return, and several sub-components which are described below. The belly of the whale represents the final separation from the hero’s known world and self. 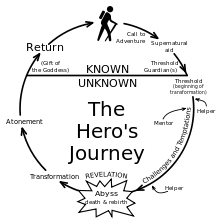 By entering this stage, the person shows willingness to undergo a metamorphosis. The trick in returning is to retain the wisdom gained on the quest, to integrate that wisdom into a human life, and then maybe figure out how to share the wisdom with the rest of the world. Why re-enter such a world? Why attempt to make plausible, or even interesting, to men and women consumed with passion, the experience of transcendental bliss?